A teenager with a painful skin condition is gearing up to take part in the VHI Women's Mini Marathon later this year. 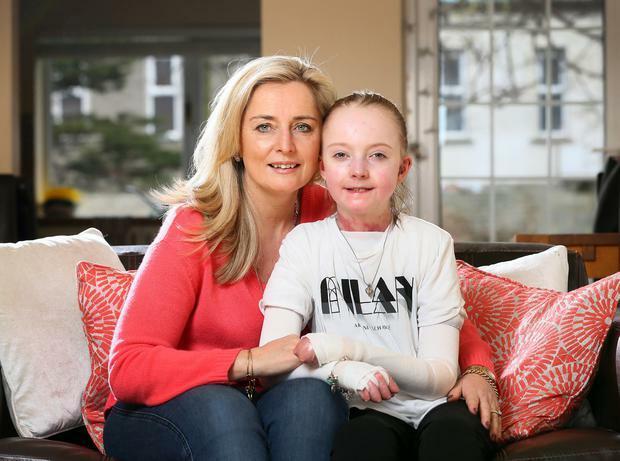 Claudia Scanlon (15), from Terenure, Co Dublin, has the severe form of the butterfly skin disease EB (epidermolysis bullosa) which leaves 80pc of her body covered in open wounds. The schoolgirl is one of just 300 people in this country with the condition and has to be bandaged almost from head to toe to protect her from everyday life. Claudia's mum Liz Collins has taken part in the Mini Marathon every year since her daughter's birth to raise funds for butterfly skin charity Debra Ireland. Now Claudia is old enough, mother and daughter are taking on the challenge together with friends of the pair helping to push Claudia's wheelchair to the finishing line on June 2. It will be a tough physical effort for Claudia, but she insists she is up for it. "I have EB so it will be a challenge. But I will be doing it in my wheelchair, with my amazing mam and her mates, who will take it in turns to get me through the full 10km," said Claudia. Debra Ireland provides day-to-day help and support for EB patients and their families. To find out more about Claudia's challenge see debraireland.org/events or call Lyndsey in Debra on 01 412 6924.